THE OUR FATHER or the Lord's Prayer has great value----above all because of its Author Who is neither a man nor an Angel, but the King of Angels and men, Our Lord and Savior Jesus Christ. Saint Cyprian says that it was fitting that our Savior by Whom we were reborn into the life of grace should also be our heavenly Master and should teach us how to pray. The beautiful order, the tender forcefulness and the clarity of this Divine Prayer pay tribute to our Divine Master's wisdom. It is a short prayer but can teach us so very much and it is well within the grasp of uneducated people, while scholars find it a continual source of meditation on the mysteries of our Faith. The Our Father contains all the duties we owe to God, the acts of all the virtues and the petitions for all our spiritual and corporal needs. Tertullian says that the Our Father is a summary of the New Testament. Thomas à Kempis says that it surpasses all the desires of all the Saints; that it is a condensation of all the beautiful sayings of all the Psalms and Canticles; that in it we ask God for everything that we need; that by it we praise Him in the very best way; that by it we lift up our souls from earth to Heaven and unite them with God. Saint John Chrysostom says that we cannot be our Master's disciples unless we pray as He did and in the way that He showed us. Moreover God the Father listens more willingly to the Prayer that we have learned from His Son rather than those of our own making which have all our human limitations. We should say the Our Father with the certitude that the eternal Father will hear it because it is the prayer of His Son Whom He always hears and we are His members. God will surely grant our petitions made through the Lord's Prayer because it is impossible to imagine that such a good Father could refuse a request couched in the language of so worthy a Son, reinforced by His merits, and made at His behest. Saint Augustine says that whenever we say the Our Father devoutly our venial sins are forgiven. The just man faIls seven times a day, but in the Lord's Prayer he will find seven petitions which will both help him to avoid downfalls and will protect him from his spiritual enemies. Our Lord, knowing how weak and helpless we are, and how many difficulties we get into, made His Prayer short and easy to say, so that if we say it devoutly and often we can be sure that Almighty God will quickly come to our aid. I have a word for you, devout souls, who pay little attention to the prayer that the Son of God gave us Himself and asked us all to say: It is high time for you to change your way of thinking. You only like prayers that men have written----as though anybody, even the most inspired man in the whole world, could possibly know more about how we ought to pray than Jesus Christ Himself! You look for prayers in books written by other men almost as though you were ashamed of saying the Prayer that Our Lord told us to say. You have managed to convince yourself that the prayers in these books are for scholars and for rich people of the upper classes and that the Rosary is only for women and children and the lower classes. As if the prayers and praises which you have been reading were more beautiful and more pleasing to God than those which are to be found in the Lord's Prayer! It is a very dangerous temptation to lose interest in the Prayer that Our Lord gave us and to take up prayers that men have written instead. Not that I disapprove of prayers that the Saints have written so as to encourage the faithful to praise God, but it is not to be endured that they should prefer the latter to the Prayer which was uttered by Wisdom Incarnate. If they ignore this Prayer it is just as though they pass up the spring to go after the brook and refusing the clear water, drink dirty water instead. 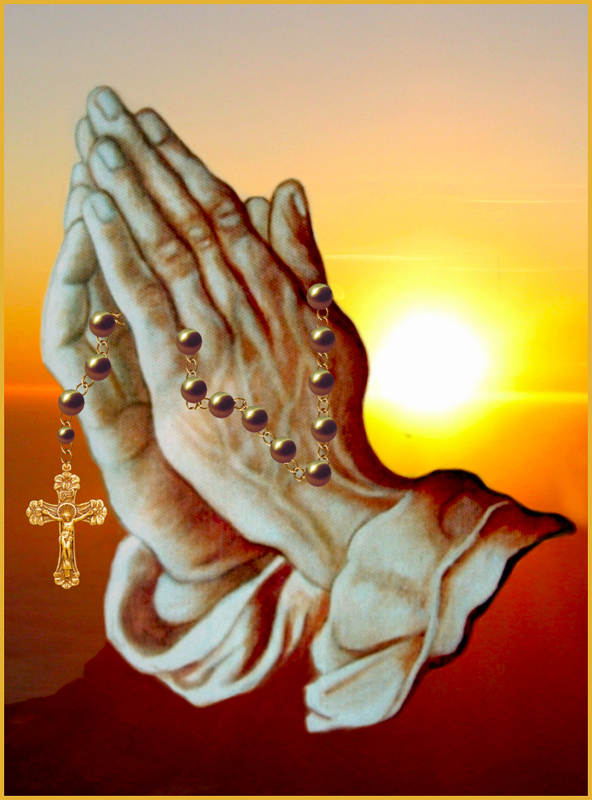 Because the Rosary made up of the Lord's Prayer and the Angelic Salutation, is this clear and ever flowing water which comes from the Fountain of Grace, whereas other prayers which they look for in books are nothing but tiny streams which spring from this fountain. People who say Our Lord's Prayer carefully, weighing every word and meditating upon it, may indeed call themselves blessed for they find therein everything that they need or can wish for. When we say this wonderful prayer we touch God's heart at----the very outset by calling Him by the sweet name of Father----Our Father. He is the dearest of fathers: all-powerful in His creation, wonderful in the way He maintains the world, completely lovable in His Divine Providence,----always good and infinitely so in the Redemption. We have God for our Father, so we are all brothers----and Heaven is our homeland and our heritage. This should be more than enough to teach us to love God and our neighbor and to be detached from the things of this world. To tend towards Thee And THEE ALONE. King David, the prophet, said that the name of the Lord is holy and awe-inspiring, and Isaias that Heaven is always echoing with the praises of the Seraphim who unceasingly praise the holiness of the Lord God of Hosts. We ask here that all the world may learn to know and adore the attributes of our God Who is so great and so holy. We ask that He may be known, loved and adored by pagans, Turks, Jews, barbarians and by all infidels----that all men may serve and glorify Him by a living faith, a staunch hope, a burning charity and by renouncing all erroneous beliefs. This all adds up to say that we pray that all men may be holy, because our God Himself is all-holy. In perfect and unending bliss. Has made it known to us. As Tertullian says, this sentence does not in the least mean that we are afraid of people thwarting God's designs because nothing whatsoever can happen without Divine Providence having foreseen it and having made it fit into His plans beforehand. No obstruction in the whole world can possibly prevent the will of God from being carried out. Rather, when we say Thy will be done, we ask God to make us humbly resigned to all that He has seen fit to send us in this life. We also ask Him to help us to do, in all things and at all times, His Holy will, made known to us by the Commandments, promptly, lovingly and faithfully as the Saints and Angels do it in Heaven. Our Lord taught us to ask God for everything that we need whether in the spiritual or temporal order. By asking for our daily bread we humbly admit our own poverty and insufficiency and pay tribute to our God, knowing that all temporal goods come from His Divine Providence. When we say bread we ask for that which is just necessary to live; and, of course, this does not include luxuries. We ask for this bread today this day which means that we are concerned only for the present, leaving the morrow in the hands of Providence. And when we ask for our daily bread we recognize that we need God's help every day and that we are entirely dependent upon Him for His help and protection. Every sin, say Saint Augustine and Tertullian, is a debt which we contract towards Almighty God and His justice demands payment down to the very last farthing. Unfortunately we all have these sad debts. No matter how many they may be we should go to God in all confidence and with true sorrow for our sins, saying "Our Father Who art in Heaven, forgive us our sins of thought and those of speech, forgive us our sins of commission and omission which make us infinitely guilty in the eyes of Thy Divine Justice. "We dare to ask this because Thou art our loving and merciful Father and because we have forgotten those who have offended us, out of obedience to Thee and out of charity. "Do not permit us, in spite of our infidelity to Thy graces, to give in to the temptations of the world, the devil and the flesh." The evil of sin and also of temporal punishment and everlasting punishment which we know that we have rightly deserved. "Amen! May it be as you have asked, for verily you have obtained what you asked for." This is what is meant by the word "Amen."